Bring music into your classroom! 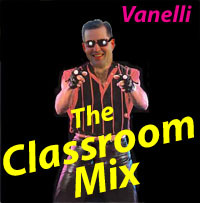 As a music lover, Vanelli began incorporating music within his high school classes. After his first hit single, “Cold in Here”, he dropped his name (Mr. Tyler) and became known on stage as Vanelli – a cross between the rappers Vanilla Ice and Nelly (this should dispel the rumors that it is because he is the white Nelly). Unfortunately for Vanelli, Nelly’s version “Hot in Here” became an instant hit and he now refuses to answer any of Vanelli’s phone calls. Over the years, Vanelli has been collaborating with other artists in creating and developing his CDs. He has been adding members to his possé known as H12 or the Henrico dozen (even though he only has 5 other members at this time: 50 Sent, his boy 10 Ses, Mini Me, Laurio and AZ). Together, 50 Sent and 10 Ses serve as his bodyguards and disciplinarians. Any problems with students in his classroom are handled by 50 Sent 10 Ses – think about it…if you still don’t get it, say it aloud fast. Below is a link to Vanelli’s website where you can hear samples of the tracks from his CDs that are still in production. His first CD, entitled The Classroom Mix, has been in the studio for several years and is constantly being updated and revised. In the summer of 2010, Vanelli hit the studio again and produced a new graphing album called Coordinate Planes. There are sure to be some future hits on this CD! If you have any requests or suggestions of songs or artists that would fit into his collection, please let him know at estyler@henrico.k12.va.us! Write some lyrics or record some songs and submit them. Vanelli is always willing to collaborate with new artists and will publish their work on this site. Warning! I do not claim that the singing is very good. Enter at your own risk.